Photographer Andy Freeberg reveals a depth of feeling, both humorous and haunting, in the women who guard Russia’s masterpieces. Her identity remains anonymous, but her face is not. The mature woman who guards the portrait of Y.M. 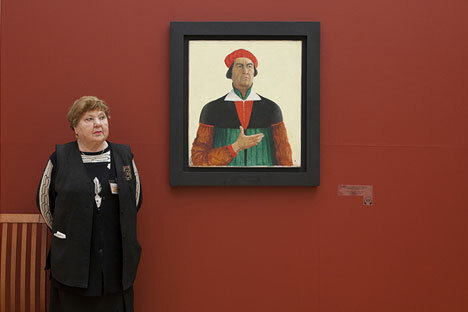 Yevreinov at the State Tretyakov Gallery in Moscow is emblematic, but her expression is singular. The viewer is riveted by her bare and gentle wistfulness, an expression borne of experience and memory that overshadows the painting she protects. “It’s a look a lot of the women have,” said Andy Freeberg, the 54-year-old photographer whose portrait series, “The Guardians of Russian Art Museums,” has become an Internet sensation. “If they don’t know you, they are not going to smile,” he added. “My sense is that smiling is something intimate.” Over time, the women did clearly become comfortable with Freeberg, yet their expressions still bear a certain gravitas and hard-earned dignity. An exhibit of the portraits is currently on view at the Cantor Arts Center Museum at Stanford University in California. In early 2013, it moves on to New York. While the portraits are serious, even somber, they also reveal a feminine whimsy never before evident in photos of the “museum babushkas” as they are sometimes derisively called. The woman seated in front of Repin’s “Portrait of Baroness von Hildenbandt,” also at the State Tretyakov, could pass for an older version of the Baroness herself (or even Anna Akhmatova). She wears a peach and purple crocheted shawl draped over black pants, with what looks like a swipe of red lipstick and a croissant-style bun on the top of her head. Born in New York City, Andy Freeberg began his professional photography career in New York taking portraits for such publications as The Village Voice, Rolling Stone, Time, and Fortune, photographing the likes of Michael Jackson, Bill Gates, and Neil Young. Freeberg has recently emerged as a droll witness and commentator to the art industry, turning his camera on the dealers, gallery patrons, artists and museum guards. His project about the women that guard the art in Russian museums won Photolucida’s Critical Mass book award and was published in 2010. Freeberg’s work is in public and private collections including the Museum of Fine Arts Boston, The Portland Art Museum, the George Eastman House, and the Museum of Fine Arts Houston. Freeberg fully intends that the guardians begin to look like the paintings they are protecting from gum-chewing 5-year-olds and oblivious texting teenagers. “After a while, part of the fun became finding the [portraits] where the women and the artwork resemble each other,” he said. Freeberg acknowledged that the lyrical-looking guard of Veronese’s “Adoration of the Shepherds,” at the State Hermitage Museum looks very much like the subject of Vermeer’s “Girl with the Pearl Earring.” She could also pass for an Italian shepherdess, perhaps, and in that way she is a kind of live extension of the painting. Another whimsical protector can be found in front of the “Matisse Still Life” at the Hermitage. Her bold, swirly sweater and printed stockings seem to match Matisse and add an air of festivity not often associated with Russian museum life. Freeberg’s photos appear to liberate the women who guard the paintings, sculptures and installations at Russia’s great museums, women who have gotten a pretty bad rap. Many an expat columnist and guidebook hack have called the ladies of the museums stern, sour, grumpy and surly. But Freeberg found something more than the sound and fury elicited by touching their art. “They are former economists and dentists, engineers and singers, teachers and clerks—a corps of grandmothers perched on chairs throughout Russia’s finest museums, becoming a kind of latter-day addition to artistic landscape,” wrote Cliff Levy, former Moscow bureau chief of The New York Times, in the foreword to the book, called “Guardians,” published by Photolucida. “These guardians are not only visible, but exert a powerful hold over the viewer, in some sense helping to bring the art to life,” Levy concluded. There is also a bit of “Whistler’s Mother” to these women that invites questions about what they are thinking and how easily they might be overlooked. One wishes to sit with them over a steaming samovar and listen to their stories well into the night. For more information vist Andy Freeberg website.